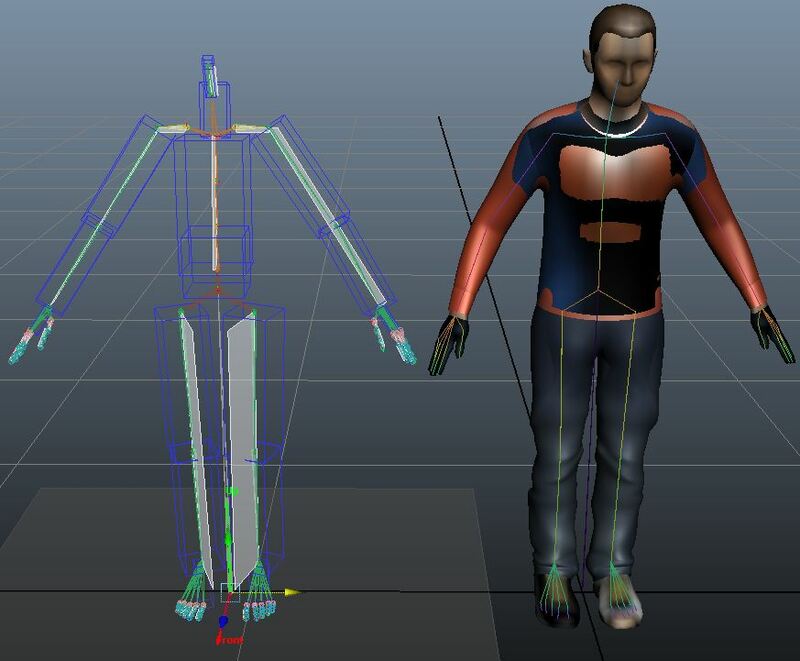 The Character Maker Locator displays the Golaem Crowd skeleton, its properties and its animation in Maya's viewport. It also allows to check that the skeleton and animation were loaded and edited correctly. 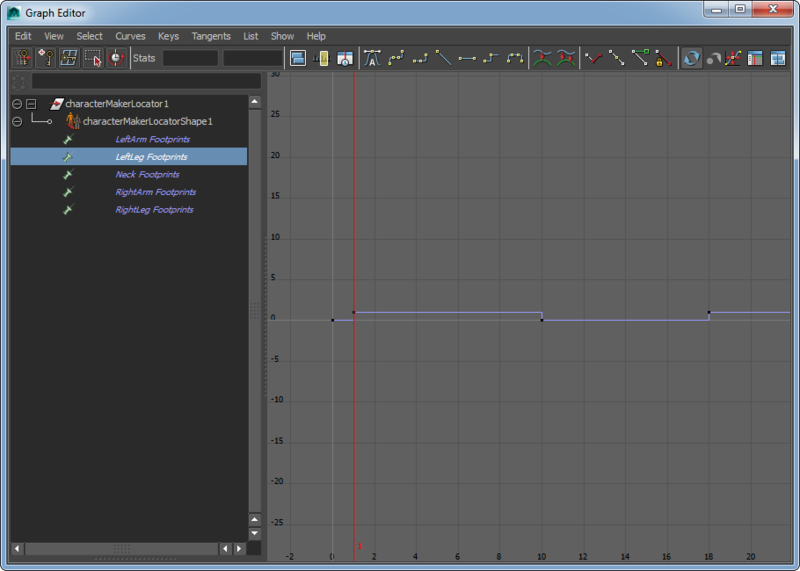 Whenever a character file is created or loaded, the Character Maker will also create a Character Maker Locator in Maya. Note that the Character Maker Locator will be created on top of your Maya character, you can move it using Maya Move Tool if you want to compare them, as in the image below. Enable Display Show/hide the Golaem Crowd skeleton. Note that the Character Maker Locator display can be enabled/disabled from the Character Maker Toolbar. Show Axes Show/hide the Up and Front axis. Show IK Planes Show/hide the character IK Normal Planes. Show Bone Names Show/hide the name of the bones according to the ones displayed in the Character Maker. Show Ground Height Show/hide the Ground Height Plane. Show Ragdoll Volumes Show/hide the bounding volumes used for Physics simulation, see Bone Physics Properties. 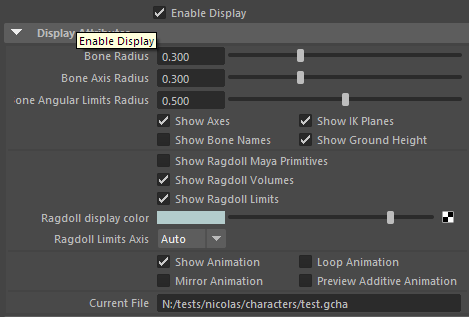 Show Ragdoll Limits Show/hide the Lower and Upper Limits of the joint physics properties, see Bone Physics Properties. Show Animation Show/hide the loaded animation in the character maker on the Golaem Crowd Locator. Loop Animation If enabled the animation will not stopped when fully played, it will restart at the beginning. Mirror Animation If enabled, the mirrored animation is played. For mirror animation to work properly, the mirror must be correctly configured on the skeleton mapping, as explained on this page. Preview Additive Animation If enabled, only the variations in the animation are played, relatively to the neutral stance displayed in red. It provides a preview of the animation if used in Additive Blend Mode in a Motion Behavior. 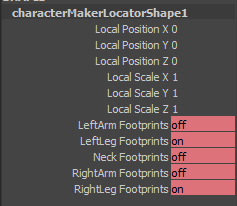 Footprints can be edited manually by editing keys on the Character Maker Locator node. New footprints can be added by adding a new key to the Time Slider.